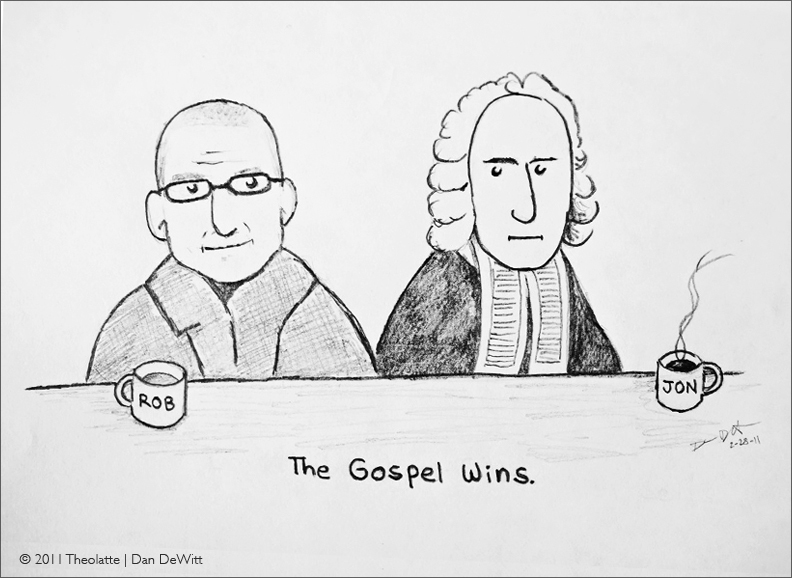 Rob Bell VS. Jonathan Edwards: Who Wins? According to Bell’s latest book, apparently love wins, but one can only wonder what exactly this might mean. The wildly popular preacher and author Rob Bell is quickly gaining attention for the content of his forthcoming book Love Wins: A Book About Heaven, Hell, and the Fate of Every Person Who Ever Lived. In what seems to be a clear move towards universalism, Bell continues to distance himself further from an orthodox understanding of the gospel. 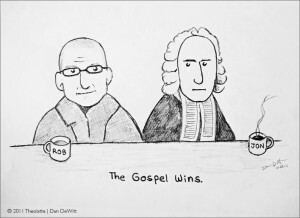 To provide contrast to Bell’s theological trajectory, I’ve included a sketch of the 18th century theologian and pastor Jonathan Edwards, who is perhaps best remembered for his sermon “Sinners In the Hands of an Angry God.” Here are some helpful articles about Rob Bell’s forthcoming book: Albert Mohler, Justin Taylor, Denny Burk, Kevin DeYoung. You can watch the promo video for the book here, which by itself is enough to warrant concern within the evangelical community.